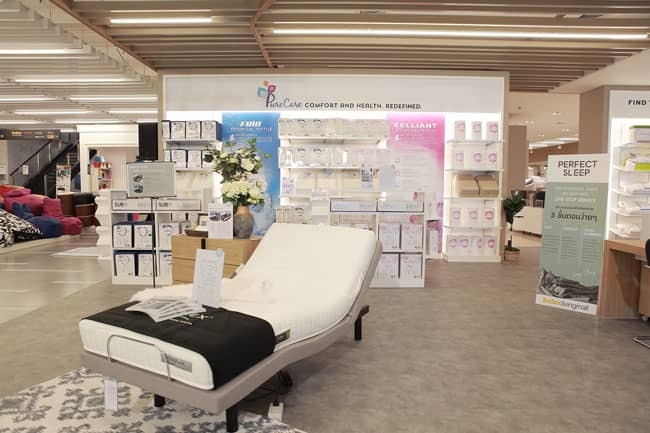 PureCare recently announced the grand opening of Index Living Mall's (ILM) “Perfect Sleep", a dynamic retail experience at ILM’s Bangna retail center which features PureCare’s technical textile-focused sleep essentials. For PureCare, the partnership with ILM has helped to highlight the tremendous role that experience-driven environments will play in the future of retail. The Perfect Sleep store offers its customers a strikingly modern retail environment focused on sleep science that is backed by clinically tested, premium products. Armed with the results of their personal “sleep scan” conducted by an in-site professional consultant, Perfect Sleep customers are free to browse a curated collection of premium soft goods that offer ideal solutions to their personal sleep needs. A key component to the successful retail concept is the focus on clean, impactful signage that adds an educational element to the shopping experience while providing complete transparency into the clinically tested benefits of their new Celliant® and FRíO® enhanced soft goods selection. The PureCare product selection found in Perfect Sleep is focused on technical textile infused sleep essentials, and includes their entire collection of clinically-tested, FDA-determined Celliant pillows, sheets and protectors. Designed to promote a temporary increase in blood flow at the site of application in healthy individuals, Celliant fibers promote increased performance, faster recovery time from physical activity and help to promote restful sleep. PureCare’s cooling collection of SUB-0º Pillows and Protectors featuring FRíO rapid chill cooling fibers and their TempSync™ Pillow collections are among other products that are prominently featured throughout the retail environment. About Index Living Mall: Index Living Mall is Thailand’s number one home furnishings and decorative retail chain store. With over forty years of business experience, Index Living Mall has developed the largest network of home goods retail stores in Thailand, self-owned factories, and an international presence and reputation as a world class exporter. Index Living Mall is committed to creating balanced living for all customers by delivering thoughtful, smart design solutions for the home and for life. For more information, please visit us at: www.indexlivingmall.com.